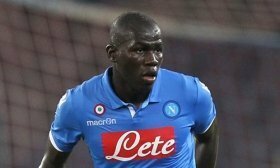 Manchester United have reportedly lodged a club-record move in order to acquire the signature of Kalidou Koulibaly from Napoli in the summer. The Red Devils are expected to spend big in the transfer market ahead of next season and the central defence has been identified as a key area in need of strengthening. According to Corriere dello Sport, the Red Devils made an offer worth £90m for the central defender at the end of March and the proposal remains on the table to date. Koulibaly has been with Napoli since the summer of 2014 and during this period, he has racked over 200 appearances for the Naples outfit across all competitions. He has been linked with Chelsea in the past but the west London club appear unlikely to make a summer approach, given they are currently under a two-window transfer ban. Koulibaly will be in Europa League action tonight when Napoli take on Arsenal in the first leg of the quarter-final at the Emirates Stadium. The Serie A side are presently second favourites behind Chelsea to win the title.